Being a professional American football player, Vita Vea is a defensive tackle for the Tampa Bay Buccaneers where he spots the number 50 jersey. Vea, who joined the NFL in 2018, is in his rookie season and is one of the young stars to watch out for in the league. Get to know more about the Polynesian player here including facts about his mother, family, ethnicity, body stats, etc. 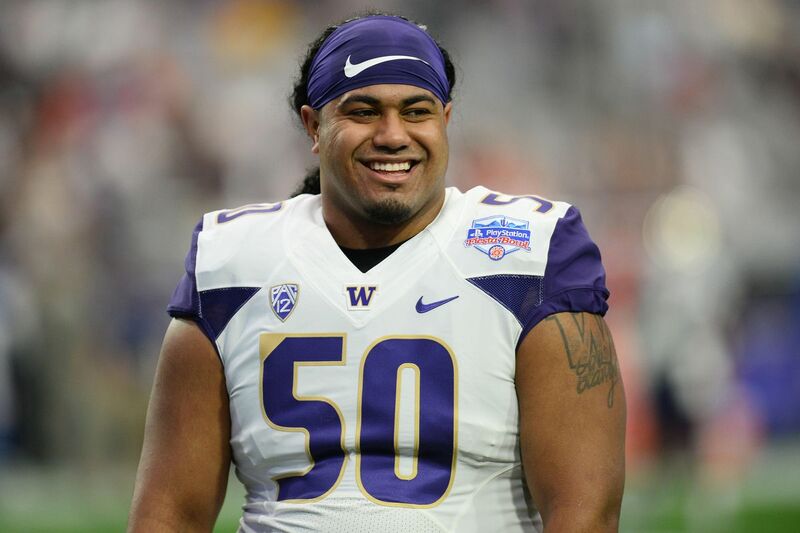 Vita Vea, whose full name is Tevita Tuliʻakiʻono Tuipulotu Mosese Vaʻhae Fehoko Faletau Vea, was born on the 5th of February 1995 in Milpitas, Santa Clara County, California. He had his education at Milpitas High School (2010 – 2013) where he was a multi-sport athlete, lettering in football and basketball. In high school, Vita Vea played in both offensive and defensive positions and took part in a total of 29 games. As a running back, he had 69 carries for 764 yards (26.3 yards per game) and 12 downs. At the defensive line, he recorded 296 tackles (out of which 196 was solo), one interception, two passes defended, 19.0 sacks, and two fumble recoveries. In recognition of his exploits, Vea received several honors including MaxPreps.com, All-NorCal first team, Division II All-State first-team, San Francisco Chronicle first-team, All-Metro, etc. With regard to ethnicity, Vita Vea is Polynesian. Yeah, he belongs to the indigenous peoples of Polynesia. Vita Vea received offers of football scholarships from several colleges including Oregon State University, University of Oregon, UCLA, but he picked the University of Washington. He spent a total of four years at Washington (2014 to 2017), redshirting in his first year. In his second year, he took part in 13 games, registering 17 tackles (three for loss), a forced fumble, one pass defended, and one sack. Vea did even better in his third year, taking part in 14 games and tallying 39 tackles (6.5 for loss), 5.0 sacks, two passes defended and a forced fumble. Vita Vea’s fourth year (2017) was his breakout season as he recorded 44 tackles (5.5 for loss), four passes defended, 2.5 sacks, and a blocked punt in a total of 13 games. As a testament to his outstanding season, he was named the Pac-12 Defensive Player of the Year and also won the Morris Trophy for Best Defensive Lineman in the Pac-12 conference. Additionally, Vita Vea was named second-team All-American by USA Today, Sports Illustrated, SB Nation and The Athletic. He was also nominated for the Polynesian Player of the Year Award. Vea decided to forgo his last year of eligibility for college football and entered the 2018 NFL draft. He was picked in the very first round by the Tampa Bay Buccaneers and was the 12th overall pick of the year’s draft. The Buccaneers locked him down on a four-year contract worth $14,824,238. Vea made his professional debut on the 30th of September 2018 in a game against the Chicago Bears. 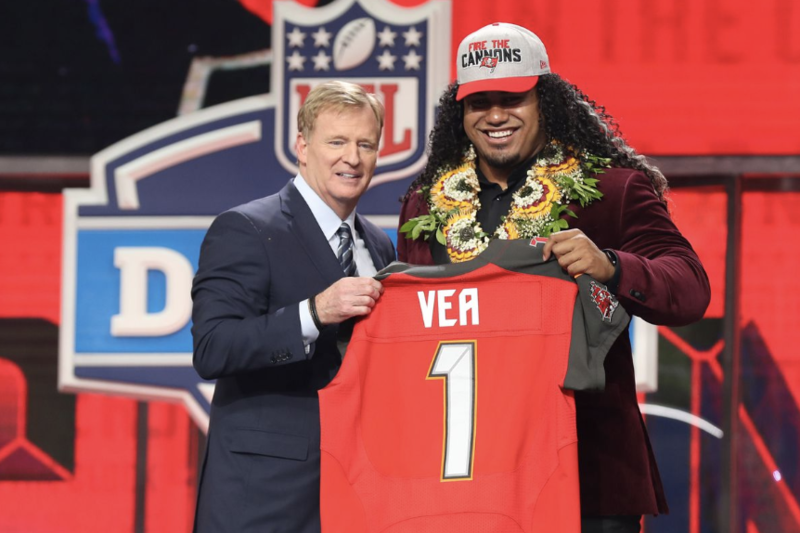 Vita Vea comes from a tight-knit family that includes Sione (dad) and Fipe (mother). He also has an elder brother by the name Sifa and an elder sister named Alisi. Vea’s parents are originally from the kingdom of Tonga, a Polynesian island nation. They both grew up in Tongatapu, a major island in Tonga but only met and married after migrating to northern California. Vita Vea’s family story is one of resilience, character, and survival. His parents had to work multiple jobs just to make ends meet. At a point, they couldn’t meet up with the mortgage payments on their home and it was repossessed by the bank. The family had to relocate to a motel room that only had one bed. It is therefore not a surprise that Vea plans to buy his family a home with his first NFL paycheck. Vea cites his mom’s selfless commitment as one of the things that pushed him to work harder in order to succeed. At a point, his mom worked as many as five jobs so as to keep the family afloat. According to Vea, he wants to succeed so that he will take care of his mom and she wouldn’t have to work anymore. Vita Vea stands at 6-foot-4 inches and weighs a colossal 347 pounds. He has a massive stature which comes in handy for the purpose of intimidating offensive players. Even though he is very large, and could easily have been clumsy; he is very athletic and moves with remarkable speed.